A new, "spectacular" specimen of Poposaurus, a rauisuchian from the Triassic Chinle formation, has been described, along with a new phylogenetic analysis. As Susan writes at Crurotarsi, "what is also interesting is the phylogenetic analysis associated with the new Poposaurus material. The most startling result is that Phytosauria falls out of the crocodile side of the archosaur tree and becomes the sister taxon of Archosauria. Depending on your definition of Crurotarsi, this could mean that dinosaurs are crurotarsans." More at Chinleana, as well. Kelmayisaurus, an obscure theropod from Early Cretaceous China, has been reassessed by a team led by Stephen L. Brusatte and is due to be published in Acta Palaeontologica Polonica. The verdict is that it represents a basal carcharodontosaurid, shedding light on how the big theropods radiated globally in the early Cretaceous. Andrea Cau posted about it at Theropoda, too. The braincase of Ceratonykus, an alvarezsaur, reveals that "alvarezsaurians had good eyesight and keen hearing and their ancestors were characterized by elements of an arboreal mode of life." The research has been published in the Paleontological Journal by Russian scientists V.R. Alifanov and S.V. Saveliev. Occidental college's Donald Prothero recently appeared on Southern California Public radio, talking about the current boom in dinosaur research, which he thinks is due in part to the "Jurassic Park generation." Also, a report on the new research that revealed that many small carnivores were likely "night-time party animals." Matt Wedel engages in a bit of prognostication at SV-POW, offering evidence for his position that Terra Nova will feature dinosauroids as a nemesis for the time travelers. March of the Dinosaurs, which aired on ITV in the UK over Easter weekend, has received a couple reviews. Dave Hone writes that he "was able to sit through all 2 hours of this without being bored" at Archosaur Musings in a generally favorable review, and Everything Dinosaur gave it the big thumbs up. In a brief post, Victoria of Pseudoplocephalus writes about a correction in the scientific literature to properly credit the discoverer of Gwawinapterus. At Whales, Camps, and Trails, check out a 40's comic adaptation of Roy Chapman Andrews' biography. "It is a kooky rendering, and yet in its own way endearing." More paleoart from the last couple decades has received attention from Trish Arnold. Ezequiel Vera shares a bit of his process in creating his Petrobrasaurus illustration, which depicts the scavenging of the sauropod by an assortment of theropods. Tony Martin is back at the Great Cretaceous Walk, in fine form! Learn all about Kronosaurus queenlandicus. Bunnies and chicks don't have a total monopoly on Easter. Witness the stash of dinosaurian goodness shared by Gary at Project Dryptosaurus. Two reactions to the recent Greg Paul paleoart controversy are explored at ART Evolved in anticipation of the rapidly approaching May hadrosaur gallery. Check out Austin Madison's very cool illustration, "The Boy Who Cried Nessy!" Really funny twist on the old story. At Paleoexhibit, Nobu discusses his current project of getting to know ancient plants better. Glendon Mellow has begun a new Tumblr dedicated to his daily speed sketches laying out the story of trilobite boy. Alain Beneteau's Teratophoneus illustration in bic pen. Cool! Dr. Steve Novella, host of the Skeptic's Guide of the Universe, on Dr. Oz. Alt-med is a marketing term, and Novella introduced that point to Oz's audience. That's about as good as can be expected. Much respect for how Novella pushes back against Oz's word games. More at Novella's excellent blog. Earlier this year, The National Archives UK released a collection of photographs as part of a project called Africa Through a Lens. Originally held by the Colonial Office, a government agency that handled the affairs of British colonial territories, they document a hundred years of British involvement on the continent. The photos have also been shared at Flickr. The sets are organized by country, and in the Lesotho set, I found this 1955 photo depicting an excavation in Triassic rocks in a village called Mahputseng. The brothers he refers to are François and Paul Ellenberger, who would later erect the name Thotobolosaurus for the Maphutseng bones. It's likely that it's one of the brothers in the photo. The name Thotobolosaurus is derived from the Sesotho word for "trash heap," referring to the village refuse pile near the spot where the fossils were found. In the early sixties, the Ellenbergers wrote that the bones "represent nearly all parts of the skeleton except the skull, and come from 7 to 8 individuals of variable size but, it seems, a single species... The preparation of all this material and the reconstruction of the skeleton evidently will be long-term." (PDF). Long-term is right; unfortunately, they still have never been formally described. They describe the dinosaur as being something close to Plateosaurus or Melanorosaurus, another basal sauropodomorph from South Africa. Considering all of the work recently done at the bottom of the sauropod family tree, it would be interesting to see some serious attention given to the Ellenberger's refuse pile find, especially since there's some doubt about whether any of the bones are sufficient to support a unique genus. As an additional bit of colonial African history, notice the name in the lower right corner, Alwyn Bisschoff, presumably the photographer. Formerly an aircraft technician for the South African air force, at the time this photo was taken he was an agricultural officer for the British government in Basutoland, Lesotho's colonial name until independence in 1966. As it turns out, he's also a bit of a hero among the Land Rover off-roading crowd. Amber's ability to exquisitely preserve bits of prehistoric ecosystems was forever implanted into the public consciousness by Michael Crichton's Jurassic Park novels and their film adaptations. I remember first reading about Ingen's use of blood from insects preserved in amber to clone dinosaurs; I felt a rush of excitement to imagine the organic material locked in chunks of ancient tree resin. While it turns out not to be a totally plausible way to populate an island full of dinosaurs, but to thirteen year old me, it was a striking idea that remains one of the most memorable parts of Jurassic Park for me. "Dino DNA!" When a piece of amber contains an insect or other piece of the biome, it's called an inclusion. The inclusion photographs in this post are the work of Danish photographer Anders Damgaard, whose website and Flickr stream contain many more examples of his work - the 3-D image on his site is especially cool. They come from his set of New Jersey amber, dating to the Cretaceous period. Enjoy, and be sure to leave some kind words in his photo comments at Flickr. 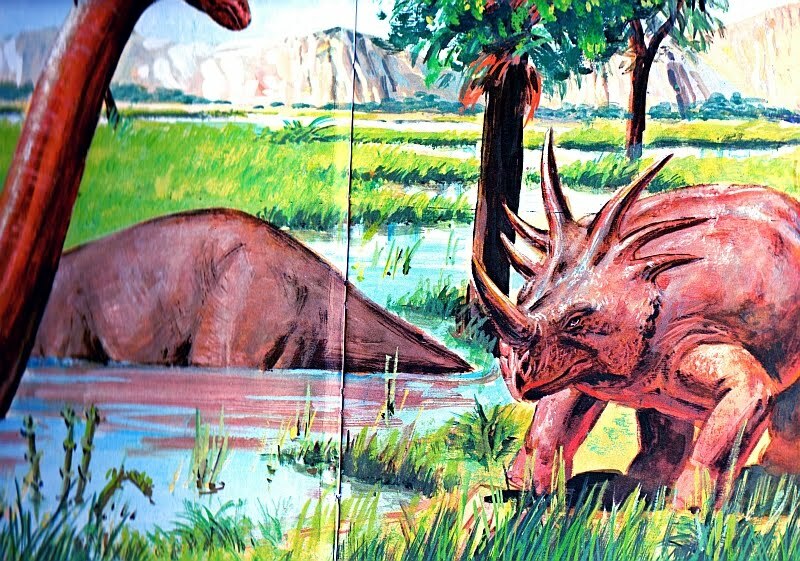 Some of the classic pieces of early paleoart is Rudolf Zallinger's set of murals at Yale's Peabody Museum. I realize I've never done a full post on them here, though I have written a bit about it (and wrote about some of his son's work). Well, that will have to wait. Today, I'm dealing with one important piece of his "Age of Reptiles" mural, the Pot-Bellied Tyrannosaurus. Image shared by Rolewiii at Flickr. Standing at the center of the Cretaceous part of the mural, Ol' Pot Belly summarizes that lost world perfectly, as far as the 1940's were concerned. Cumbersome, imposing, red-eyed, he towers over all of the other animals in the scene. You have to wonder how many more there are in that bulging gut. Photo by Marxchivist, via Flickr. It's understandable why the Marx company used the Pot-Bellied T. rex as the inspiration for their own tyrant king, included in their 1957 "Prehistoric Times" play set. With an anachronistic mix of prehistoric animals to serve as their friends and enemies, how many kids used the cavemen as proxies for themselves in their adventures? I personally would have spent a lot of time making the yellow caveman in the lower left surf on the back of an ankylosaur. Photo by djnick66, via Flickr. Just as in the Cretaceous portion of "Age of Reptiles," Tyrannosaurus was the centerpiece of the Marx play set. It's not the most dynamic pose, but at least he wasn't in danger of falling over as the rest of his neighbors scurried and lumbered about in his shadow, nervously hoping he didn't get a hankering for their particular flavor of reptile meat. I encourage you to check out The Dinosaur Toys Collector's Guide, which thoroughly covers both the Pot-Bellied T. rex and the Marx playset it is part of. And the Peabody Museum hosts a wealth of content about "The Age of Reptiles," including interviews and audio pieces about its creation and the world it depicts. Readers who click over to blogger to read Love in the Time of Chasmosaurs probably notice something a little different here today. I done redesigned the blog. It's been long-needed, but I decided to be deliberate about it and not make my move until I was good and ready, and felt I had it right. I think I do. The image I used in the header comes from the Vintage Dinosaur Art pool. It's by Tom Dunnington, and it's one of my favorite illustrations I've come across since starting the series. Accurate to the way life was lived by the great archosaurs of the Mesozoic? Probably not. But it's true to the various strange ways our relationship with that extinct world manifests itself. Of course, I didn't really overthink it when I chose it. It's just a nifty image and fits the tone of the blog well. It wasn't planned, but this week ended up being pretty childish around these parts. It began with a Vintage Dinosaur Art post about a dinosaur sticker book that seemed to bring a bunch of readers and tweeps back to their childhood. On Wednesday, I wrote a very touching tribute to science education superhero Mookie Harris (sorry if the tears ruined any keyboards). Yesterday, I took a look at some wacky dinosaur toys I noticed at my local Target. This week's roundup will continue this theme, featuring plenty of links looking at the relationship between children and dinosaurs. Nephila jurassica, the largest spider fossil ever discovered, made some waves this week. It's about as large as the largest modern golden orb weavers, so we're not talking Shelob here, but the fine detail of its preservation is definitely worth the attention. No evidence yet as to the conjectured presence of a tuffet. More at Dinosaur Tracking and LiveScience. I'm a fan of Mike Meraz, a podcaster I've mentioned here before. He's responsible for Actually Speaking, a terrific series about communicating the skeptical worldview effectively. Actually Speaking has been on a bit of a hiatus lately, but his recent interview on Meet the Skeptics reminded me that I had not yet heard his young son's podcast. It's a grievous oversight. Called Aaron's World, it's just wrapped up its first year of episodes, all about dinosaurs. It's terrific. Listen to him get tickled by penguins, consider the tree-climbing abilities of chihuahuas, and take a flight on Pretzel the Pteranodon. Also be sure to check out the gallery of listener-submitted artwork. 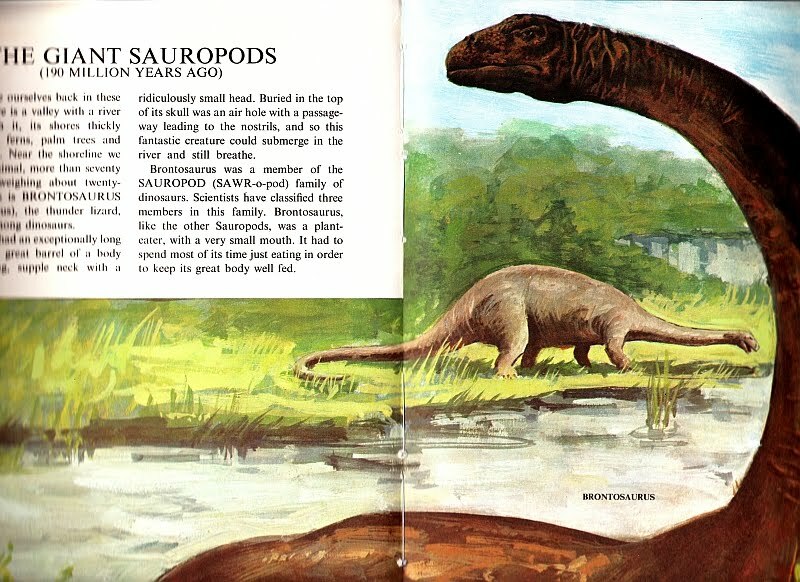 My favorite dinosaur book when I was young was the Eyewitness Visual Dictionary of Dinosaurs. Trish takes a good look at it at her Obligatory Art Blog as her April series of 80's and 90's paleoart thunders on. Took me right back to the first time I saw the Dale Russell Troodon model. At Gothamist, check out a hilarious feedback card submitted to the Museum of Modern Art by a little girl who was incensed over the lack of dinosaurs. "You call yourself a museum!" Dave Hone interviewed artist Brian Choo at Archosaur Musings. Wonderful stuff. At DinoGoss, Matt Martyniuk examined the tricky proposition of correctly restoring beaks with teeth in non-avian theropods. Dan Chure's Dinosaur National Monument Quarry Visitor Center blog featured a post on sculptor Allan McCollum's exhibit Lost Objects. In the wake of last week's paper on the time of day dinosaurs were active, Jaime Headden wrote a bit on what we can tell as to the size of the eyeball in oviraptorids. In his words: "It should be clear at this point that oviraptorids probably had bleedin’ enormous eyeballs." For pure gleeful dinosaur weirdness, you just can't beat Therizinosaurus. "Maybe the T-Rex didn't have stumpy little claw-arms." That's because they're Iguanodons. I hate double standards. Baby wears this? Totally acceptable. I wear this? Shunned by polite society. What are rauisuchians? Get up to speed on these exotic archosaurs at Dave Hone's blog. Today, I feature a truly iconic image which has influenced an entire generation of paleoartists. 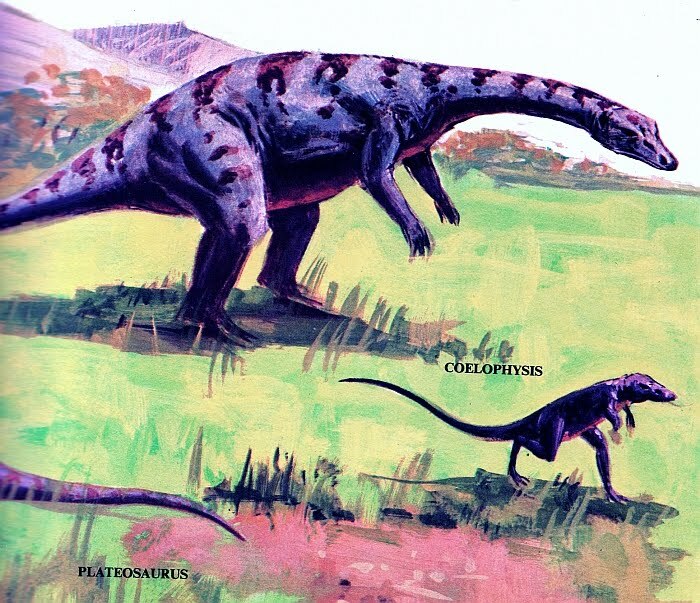 It's also one of my favorite dinosaur illustrations from my childhood. I speak, of course, of Farrah Fossil. As I think about how I thought of dinosaurs when I was young, it seems that they were part and parcel with another common childhood obsession: the monsters, shades, and rumored entities you read about in books like the Mysteries of the Unknown series or hear about on Coast to Coast AM. Certainly, dinosaurs and other prehistoric beasts are part of cryptid lore, from stories like the Ropen or Mokele-Mbembe. Dinosaurs have retained their attraction for me because of their reality. As more and more evidence mounts, they actually get stranger, more fantastic, more enthralling. Unfortunately, most of the cryptids I loved when I was young have had their sheen rubbed off by a parade of hoaxes and misinterpreted sightings. Still, I enjoy the stories. Monster Talk, a podcast by Skeptic Magazine, is a wonderful place to listen to fair, skeptical treatment of cryptozoological research. Fans of super-low budget B-movies, take note of Brett Kelly's 2009 "dino-comedy" She-Rex. It's described as "a cross between Abbott and Costello meets Jurassic Park." Yup. I'm going to get all Dinosaur Toy Blog on y'all today, as I took the liberty of snapping some photos of a few dinosaur toys at Target this week. forgive the lo-res quality of these. I've got a chintzy little Samsung, not some boo-boo iPhone or android. No instagram/ hipstamatic flavor here. Though the popularity of those nostalgiafying photo apps probably indicates that in a few decades, these photos will be perfectly fashionable. Anyhow, the first three are from the Mattel "Prehistoric Pets" series. 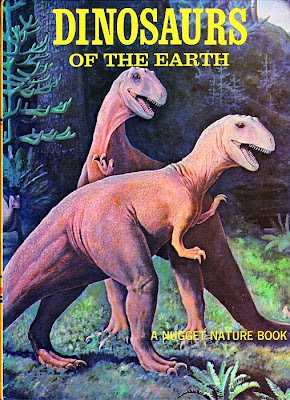 When I saw the first two, I wasn't even sure that they were intended to be dinosaurs. I was right about the first one, which turns out to be a heavily stylized Dimetrodon. Not sure that it's the best toy for a little kid, though, as it gives a surprisingly strong bite. There's another which turns out to be a Carnotaurus, which takes the short snout of the abelisaur to an extreme, ending up with what looks more like an anurognathid pterosaur's kisser. Just mind that squirt alert, people. The only other member of this collection in stock was the instantly recognizable, chimeric pterosaur thing "Terrordactyl," which is not to be messed with. I'm not sure I want to know what a "sticky grub projectile" is. It can't be pleasant. Of course, you want to see these in action, don't you? Finally, there's this blue Dilophosaurus, clearly inspired by the Jurassic Park depiction of the Jurassic theropod. The toy was probably designed off the top of someone's head, as it's hard to imagine any image of it was consulted. The animal's titular crests have been pushed back to behind the eyes. The strangest feature, though, are those hands. They're correctly oriented, but they've only got two digits. If this was a tyrannosaur, we'd be in great shape. But it's not. So, you know. Recall time, Target. Last October, I had the great - by which I mean unimaginably fun - pleasure of visiting the Children's Museum of Indianapolis and taking a look at how they do what they do. What they do is deliver top-notch, engaging education to kids, cleverly disguising it as having a heck of a fun time. As Josh Estes, manager of the museum's centerpiece, The Dinosphere, guided me through the exhibit, I received a crash course in exhibit design and visitor interaction. I met a crew of people who put their hearts into giving children an unforgettable experience. They do it by making the children feel like an integral part of the experience. More than facts, children visiting the museum come away with the experience of problem solving and thinking critically. To read more about my visit, please check out my weeklong series devoted to it. Today, I want to give a few words to one of the most memorable people I met that day, Mookie Harris. I met him as he was taking part in an activity with a young visitor, in which he draws a reconstruction of an animal based on a child's observations of a tapir skull. The results, you might guess, vary widely. What I love about it is that the "right or wrong" of the child's guesses as to the skull's original owner don't matter. What matters is that the child figures out that he or she has just done the exact same thing a paleontologist does with a fossil. They have the tools to do it - all they lack is a bit of comparative anatomy education. I've since seen him do the same with my niece, Molly, and she was just as engaged. In a post about one of the museum's big attractions, Dracorex, I wrote, "Mookie told me that he's really heartened by the level of knowledge displayed by his young visitors, especially the increasing numbers of girls who have a real investment in dinosaurs. He thinks that it has a lot to do with documentaries in the style of Walking With Dinosaurs, which portray dinosaurs as animals rather than monsters." This was a new insight to me. Mookie, your Jedi powers work on adults, too. This week, the Children's Museum bids Mookie farewell as he leaves for a new opportunity at the Glazer Children's Museum in Tampa, Florida. I'm sure the folks there believe they've made a good choice, but I think they'll be pleasantly surprised by just how good it is. This is a man who understands that making a personal connection with the children who come to the museum is more important than delivering facts, even more important than demonstrating the process of science. Those things are important, no doubt. But they mean more when they come with a human relationship. I'm reminded of another time I saw Mookie talking with a boy in the Children's Museum's simulated dig site. As the boy rattled off theories about dinosaur migration, Mookie was totally engaged with him, and I'll bet that after the boy left the museum with his parents, that experience of being taken seriously and tossing ideas around with an interested adult will stick with him. In my interview with Josh Estes last year, I embedded one of the museum's "This Week's Wow!" videos, in which Mookie's talents as a performer are put to good use. If you haven't checked these out, take some time to browse through the Children's Museum's Youtube Channel. And enjoy this one, in which Josh gives Mookie an appropriately geeky send-off. See you in Tampa, Mookie! Image courtesy BBC Two, via Flickr. One of my favorites is Stephen Fry. Favorite what? Name it. Writer. Actor. Comedian. All around smart, compassionate, insightful human being. So I cannot wait to watch ITV's March of the Dinosaurs documentary, which Fry will be narrating. March of the Dinosaurs is a big paleontology story told as an epic family feature. And if you think you’ve seen dinosaurs then stand by for super-sized feathered killers and colossal herds slogging through the ice and snow to escape perpetual night. After 70 million years out of the limelight it’s just perfect that these dinosaurs are going to make their comeback on as big a channel as ITV1. Super-sized feathered killers. Most excellent. Update - Thanks to commenter Albertonykus for sharing this link to production stills, confirming the presence of feathers and general dinosaurs in blizzard badness. Everything Dinosaur additionally reports that the program will air next Sunday, April 23 at 5PM in the UK. Thanks to the efforts of reader Ryan DeLuca, today I'll be sharing a really cool piece of dinosaur print ephemera from the 80's: a sticker album printed by the Italian company Panini. On Flickr, Ryan writes that it "cost $.35 for the album which was blank and you bought random packs of stickers (usually from the grocery store checkout aisle) to complete the album." The artwork is a mix of styles, and likely a few different artists were employed, but they are not credited in the book. 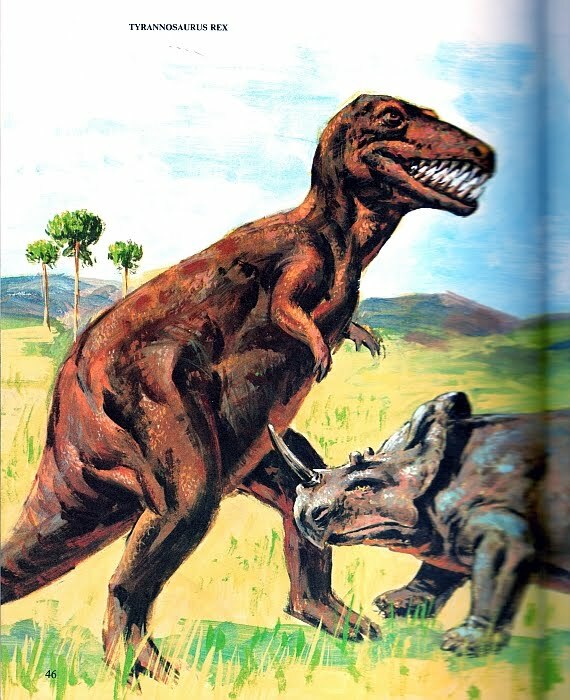 The book introduces the reader to all sorts of prehistoric animals, and is notable for just how gonzo some of the depictions are: though there are some static, lateral views of the animals, it also features wild predator-prey interactions. Witness the Ceratosaurus feeding frenzy below. In addition to lurid depictions of ancient life, red in dentition and unguals, the book includes some hilariously wrong copy coupled with excessive exclamation mark usage. Read this account of the earliest reptile life. "It's a gigantic tyrannosaurus, as big as a tree and a ruthless killer!" 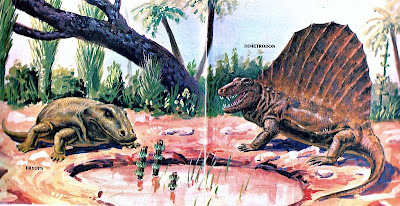 Also of note is the swimming Dimetrodon, about to go ballistic on a Diplocaulus, who the authors want you to compare to extant animals with sails on their backs. I love the wonderfully overheated caption for image 72, which describes a Cynognathus "brutally attacking the peace-loving kannemeyeria, tearing at its back!" 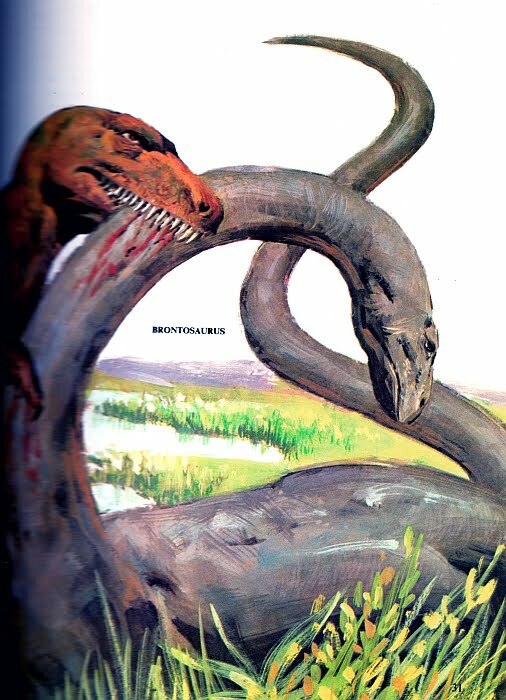 The pages devoted to sauropods and pterosaurs (sorry, "flying dinosaurs") show, predictably, a mix of Knight and Burian influences, some blatant ripoffs, others somewhat modified. Despite the way the writer plays fast and loose with the evolutionary relationships between aquatic reptiles, pterosaurs, and dinosaurs, they oddly make a point of stressing that birds are not the descendants of pterosaurs. The "flying dinosaurs" naturally have counterparts in the sea. Meet the "dinosaurs in water," a mix of aquatic reptiles of various stripes and true-blue dinosaurs like the lambeosaur Parasaurolophus, here using its impressive crest as a snorkel. 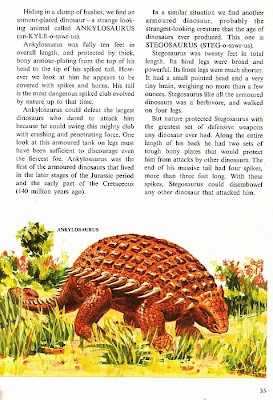 Not even the scientist who coined the term "Dinosauria" is immune to the illustrators' penchant for tracing Burian's work. I speak of Richard Owen, in the middle of the bottom row here, whose face resembles Burian's portrait a bit too closely for comfort. Likely working on a tight deadline and for little money, it's not too surprising that the illustrators basically picked from a grab-bag of old artistic and behavioral tropes. Still, I must admit that I find it a little shocking that the makers of a sticker book for children wouldn't devote the time and effort it takes to depict ancient life according to the best contemporary scientific understanding. If this project doesn't deserve that devotion to the facts, what does? Thanks again to Ryan for sharing this piece of childhood memorabilia with us. You can find the rest of his scans at the Vintage Dinosaur Art Flickr group. Feel free to scan the old dinosaur books in your collection and share them there, too. Smelly Dinosaurs: A new paper explores the evolution of the olfactory sense among modern birds, extinct birds and theropods, finding that a greater sense of smell among early ancestors of modern birds may have made a difference in allowing them to survive the K-Pg extinction. Witmer Lab created this video to accompany the research. More at The Dragon's Tales and Dinosaur Tracking. The Daily Routines of Dinosaurs: New research looks at the scleral rings, which encased the eye, of a variety of dinosaurs to determine at what time during the day they were most active. Most, it turns out, were not diurnal, instead going about their business in the dawn and dusk hours. Wonderfully covered by Ed Yong at Not Exactly Rocket Science. Daemonosaurus: Another Triassic dinosaur is soon to be published, hinting at a rich diversity of new early theropods yet to be discovered. Read more at Dinosaur Tracking, Chinleana, Discovery News, and History of Geology. Liaconodon: A new Mesozoic mammal has shed valuable light on the evolution of the mammalian ear. You know, one of those transitional fossils that supposedly don't exist. More at The Dragon's Tales, Chinleana, Palaeoblog. The Flying Trilobite's Glendon Mellow announced that his Etsy shop has been stocked with cool stuff. Need some nifty paleocentric artwork for your home or office? Head over there and peruse his fine wares. Nobu's blogging! Welcome Mr. Tamura's new blog, Paleoexhibit, with an opening post about the new heterodontosaur Manidens. Andrea Cau wrote about the diversity of sizes among theropods at his blog Theropoda. Dave Hone's Zuchengtyrannus is the gift that keeps on giving. Today at Archosaur Musings, artist Bob Nicholls discusses his process for creating the striking restoration, a "show-off male with an eye stripe and blood red patches for impressing the tyrannosaur ladies" which accompanied the paper in the press. Hone also had James Whitlock come in to discuss his recent paper on sauropod feeding strategies. Jamie Headden writes about one of his favorite subjects, dinosaur teeth, in a response to the announcement of "buck-toothed" Daemonosaurus. Robert Krulwich wrote about TriceraFail, and other instances of science "changing its mind" at his NPR blog. Saurian discussed the great importance of good record-keeping as to the history of fossils. Brian Switek wrote about the recent paper concerning dinosaurs and lice at Dinosaur Tracking. At Omegafauna, Sharon has been sharing some wonderful dinosaur-themed fabric patterns she's been creating, and this week showed off the test swatches she's received. They'd make the most excellent curtains ever, I'm sure you'll agree. Mike Habib posted about the agile insect-catching lifestyle of anurognathid pterosaurs at the Pterosaur.net blog, hinting at a coming paper. Gary of Project Dryptosaurus gushed about the Morris Museum in Morristown, NJ, which is soon to be home to a Dino Day event on April 30. Head to Project Drypto for more details. Stu Pond explores that ever-confusing line between fact and fantasy in paleoart at Paleo Illustrata. Keeping true to her promise to devote the month of April to 80's and 90's paleoart, Trish is writing about the MacMillan Illustrated Encyclopedia of Dinosaurs and Prehistoric Animals at her Obligatory Art Blog. Start here! At ART Evolved, Darthsantuzzo posted an intriguing piece about how many dinosaur toys seem to be directly inspired by pieces of paleoart, with no clear indication of their artistic heritage. @xisor: Emily Brontësaurus #EvilDinosaurs #RomanticismIsEvilRight? And the prize for strangest suggestion goes to @wackyvorlon for: "Anti-Semitic mollusc #EvilDinosaurs"
I wrote about this project above and couldn't resist picking one this week for this spot in the roundup. Check out the true coolness of Sharon Wegner-Larson's Ptera-Island pattern. I've been involved off and on with a film collective with come of my Bloomington friends for years, having written and acted in a few short films over the years. They've recently ramped up their activity, taking on some very cool video projects, including a Caravaggio-inspired video for Dylan Ettinger's single Lion of Judah. Check out 19th State Productions on Tumblr. News Alert: Children Still Love Dinosaurs! Juuuuust in case you'd forgotten how much kids love dinosaurs, I've got a couple videos that should jog your memory. First, one of those incredible Walking With Dinosaurs live show puppets makes some kids go bananas. Thanks to Phil Plait for sharing this, and @earthwards for tweeting it in my general direction. Next up, a video from the third graders of John Riggio School in Stockton, California to promote their play "The Dinosaur Reunion." If you're in the Stockton area and would like to catch it, you'd better be quick, as today is the production's last performance. Though I'd bet that tickets have been selling well enough to justify a return engagement. "I'm dense, man!" Let's make this go viral. 33 views when I found it. How high can we make it go? My absolute favorite thing to do when standing before a mounted dinosaur is to look for pathologies. That's a fancy, exquisitely sciencey way of saying that I like to spot evidence injuries or sickness - spots where disease or violent mischief have left their mark on the animal's skeleton in the form of breaks, holes, or my personal favorite: big, knobbly protrusions. One of the dinosaurian residents of my cubicle at work is a daily reminder of this sublime pleasure. As you can see, his left forelimb has been completely broken in two. But he soldiers on. I've had this little dude since I was little. I may have found it in an Easter basket, cleverly hidden among the candy in his egg form. That's the cool thing: when necessary, he can be cracked open, and his limbs, head, and tail can fold in. He was made by Bandai, and unfortunately the blue pterosaur that was his faithful partner in crime went missing long ago. We miss you, blue pterosaur. Shared by Tokka at Flickr. Seems like he'd have a heck of a time with another dinosaur extraordinaire, Yellow Dinosaur. YELLOW DINO: PEDO HUNTER from Everything Is Terrible! on Vimeo. It would be a great team! Rocky D. could lure children with candy, and Yellow Dinosaur could deliver a good lecture on avoiding "tricky people." Somebody get this poor fellow a cobb salad... or a thousand. Photo by Accent on Eclectic, via Flickr. From a small park in Wharton, TX. Today I'm happy to welcome Marc Vincent, who is contributing the very first Love in the Time of Chasmosaurs guest post. Marc one of the writers of the dependably enjoyable Dinosaur Toy Blog, posting under the handle mhorridus, which he also tweets under. He's done a bang-up job, I'm sure you'll agree. I rescued this rather charming, but apparently unwanted work (copyright 1965) from a second hand bookshop for the princely sum of 40 pence (about 65 cents USD). Much nerdy glee ensued, as it contains almost every pre-Dino Renaissance cliché you'd care to mention, from swamp-bound blobby sauropods to man-in-a-suit theropods shuffling menacingly about, looking for their zimmer frames. Oh, and all the dinosaurs look spectacularly, crushingly bored – as well they might, as apparently the Earth was just one giant savannah grassland throughout the Mesozoic, which must have got monotonous. Onwards then with Dinosaurs of the Earth (a Nugget Nature book from Collins), illustrated by one Sol Korby, online searches for whom turn up an awful lot of portraiture. Obviously he was just jobbing with the dinosaur thing, and the rip-offs of classic palaeoart are plain to see. The cover sets the precedent. It's better quality than the material inside, but then it wasn't painted by Sol – apparently it's borrowed from the archives of the American Museum of Natural History. The upright, tail-dragging allosaurs aren't so bad for 1965, although bizarrely they are missing their first toe on each foot. Never mind, nobody'll notice. 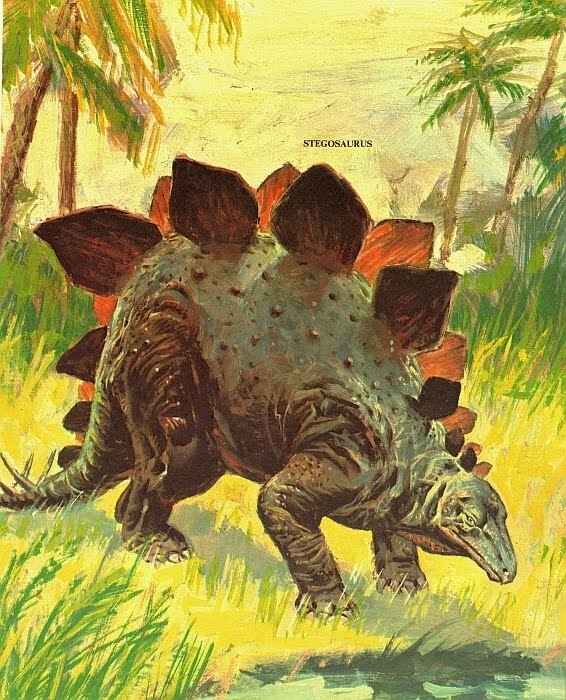 The inside cover features this absolute doughball of a Styracosaurus – clearly, all that anachronistic grass hasn't been good for him - alongside a couple of wallowing generic sauropods. Yeah, it's going to be one of those types of books. 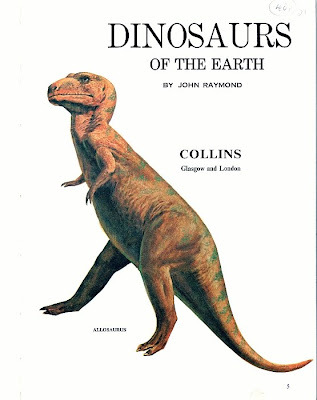 The title page, meanwhile, features a bizarrely-angled flying tyrannosaur with the label “ALLOSAURUS” – and still no first toe! Like so many dinosaur books aimed at kids, there's a bit of a preamble through the Palaeozoic before you get to the Mesozoic good stuff. Naturally, any populist dinosaur book/movie/attraction/toy range worth its salt will bafflingly feature Dimetrodon for no really good reason other than it looks cool, and so it pops up here, cheerily greeting a rather sullen-looking Eryops. 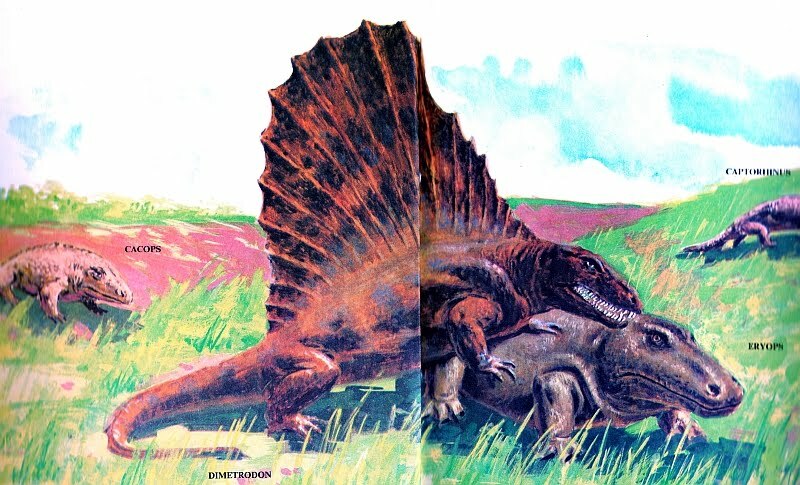 Of course, this jocular state of affairs can't last long, and on the next page Dimetrodon has turned mean and, uh, mounted Eryops in a savage act of predation out on the pleasant rolling grassy meadow. Weird, for sure, but there's far stranger to follow. The book is written as a 'journey' through prehistory (in a suitably matter-of-fact 1960s fashion). Arriving in the Triassic, we come upon some Plateosaurus – that aren't dragging their tails! - and a bizarre rat-like creature with long hind legs. Oh wait, that's Coelophysis. Happily we revert to 19th Century-level palaeontology when we arrive in the Jurassic and find a chimeratastic “Brontosaurus” lurking in a pond of convenient depth. It's very obviously 'inspired' by a certain painting by one Charles R. Knight. Over the next few pages we are also introduced to Diplodocus and Brachiosaurus (which is using its trademark uphill body plan to, er, pluck reeds from the riverbank), animals we are assured “were so heavy that they had to stay in water most of the time...to support the weight of their bodies” as well as to keep well away from “the more intelligent carnivores on land”. The screaming you hear is coming from SV-POW. Alas, poor old phylotarded Bronto is no match for Allosaurus, who casually strolls up and takes a bite out of its gamy neck. Stegosaurus next, united at last on a double-page spread with Ankylosaurus, which lived a mere 85 million years in the future. The Stegosaurus is the standard hump-backed Burian-style affair, but the Ankylosaurus is a truly strange, squat, neckless armadillo-like beast. Admittedly it was still quite common to portray the animal in that fashion at the time, but that doesn't make it any less freakin' weird. Moving on to the Cretaceous, and it's time for the hadrosaur “swimming party”. Oh yes. 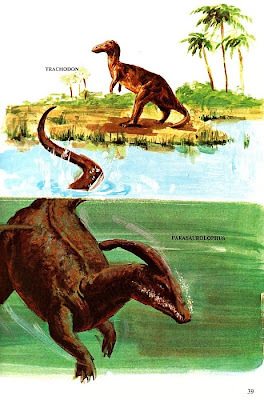 Not a lot to add to this wacky image of a toad-like Parasaurolophus and mutant Corythosaurus gaily going for a dip. Enjoy. Finally, it's time to bring in the big guns, by which of course I mean Tyrannosaurus, here in full-on Godzilla mode. It's pretty hard to picture this fat old tyrant wheezing along after its hadrosaur prey, but here it is waddling into the horn of an anachronistic Monoclonius. 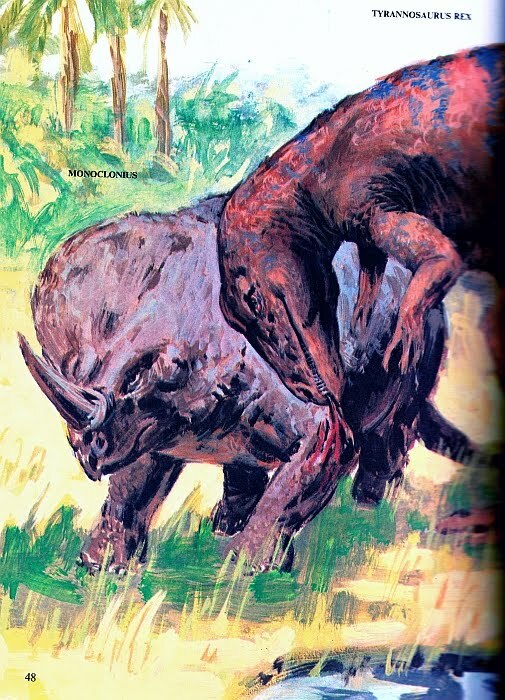 You'd have thought that ripping off Chaz Knight's infamous T. rex vs. Triceratops painting would've been easier, but never mind – here's the once-popular centrosaurine instead, here described rather unkindly as an “ugly beast” and even “the most dull-witted animal of them all”. With wording like that, you just know it's going to end up as T. rex feed. And it does – although it looks rather unconcerned about the whole thing, just standing idly by while T. rex takes a nibble. As if anyone would believe that these days! Ha ha ha. HA HA HA. Thanks again to Marc for contributing an excellent piece to the Vintage Dinosaur Art series. Be sure to follow the Dinosaur Toy Blog if you don't already. Besides fun writing on admirable and laughable toys, the group also manages to squeeze in some great anatomical information. If you've got something you'd like to post about here, hit me up at the email in the sidebar. 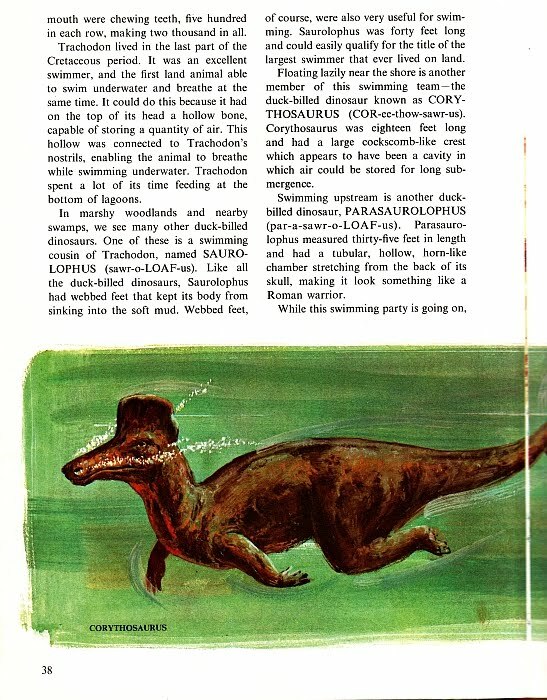 As always, share your own scans or photos of old dinosaur illustrations at the Vintage Dinosaur Art flickr pool. I truly love the itty-bitty ornithischians. They don't get much love, but that just makes me want to proclaim my appreciation in increasingly strident tones. Meet Manidens condorensis. The basal heterodontosaur from Mid-Jurassic Argentina got mentions at Tayler Reints' new Life As We Know It blog and Chinleana. Research into the phylogeny of lice - a fascinating evolutionary topic that belies the yuck factor we might associate with them - suggests that the first critters they inhabited may have been feathered dinosaurs. Very cool. Covered at the NY Times, Wired, Livescience, and Discovery News. A new study by John Whitlock has found that the wear traces on the teeth of diplodocoid sauropods reveals a diverse array of feeding strategies, tied to the environments in which the taxa lived. Published at PLoS One, so head over to give it a read. April's edition of the Boneyard Blog Carnival was a doozy. Head over to Sorting Out Science to engorge yourself on sizzlin' hot chunks of paleontology. Saurian wrote a review of last year's New Perspectives on Horned Dinosaurs, which he feels sets the standard for future volumes. Philip J. Currie, Canada's legendary dinosaur paleontologist, has been honored by having the River of Death and Discovery Museum renamed in his honor. Read more at Whales, Camps, and Trails (twice), Palaeoblog, and Pseudoplocephalus. SV-POW contributed two slices of pipin' hot sauropodian goodness this week, with Mike Taylor's fun roundup of theropod stompers and Matt Wedel's reflection on what Walter Coombs referred to as the sauropods' chimaeric qualities. Bill Parker shared another newly-colorized archosaur restoration from Jeff Martz, Poposaurus, at Chinleana. At The Bite Stuff, Jaime Headden wrote about the possibility of fuzzy integument in the ornithischians. Zach Miller wrote a great satirical post about the Greg Paul paleoart debacle of last month at When Pigs Fly Returns. Building anticipation for his in-the-works Date with a Dinosaur book, which will explore the intersection of dino pop culture and science from the perspective of someone who has seen their childhood image of dinosaurs radically changed, Brian Switek wrote a series on 90's dinosaur comics at Dinosaur Tracking. Paleo, Age of Reptiles, Tyrant, and Dinosaurs: A Celebration. Trish Arnold offers a characteristically hilarious recap of the 1983 A Field Guide to Dinosaurs in two posts this week (one and two). 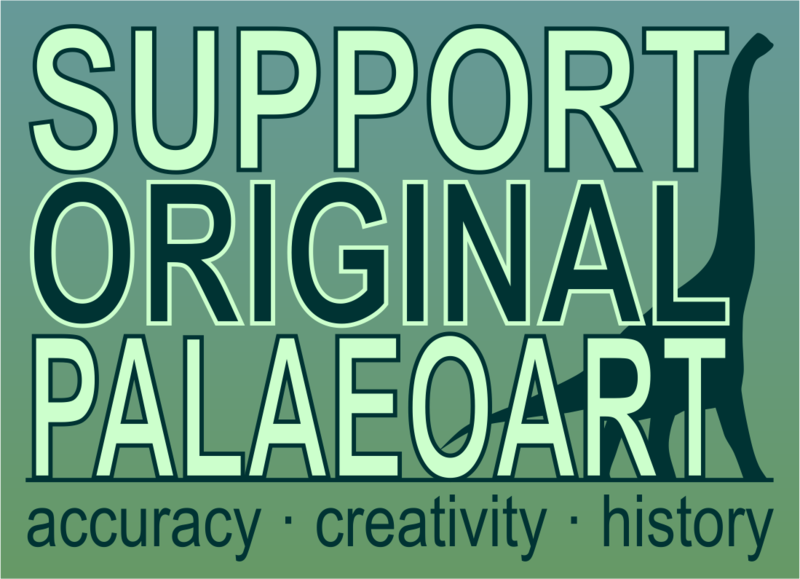 It's part of her April celebration of 80's and 90's paleoart, so folks who enjoy my weekly Vintage Dinosaur Art posts should bop on over to her blog, if you aren't already reading it. At his aptly-titled Adventureblog, Michael May gives a shout out to the short-lived Hanna Barbera cartoon Valley of Dinosaurs on DVD. May admits that the power of nostalgia is overcoming the price tag. Angie Rodrigues shares a sketch which helped her explore color patterns in hadrosaurs. It's a sign of true talent and dedication when a piece like this looks as good as many finished pieces! A Surf Scoter in Southern Indiana! Sedimentology and taphonomy and the Ediacaran "mops"
Anthony Maltese on Campanian ceratopsians, including a possible new species in prep & the group's namesake, Ceratops. I love the crosshatching in this Yangchuanosaurus by Paul Heaston. Be sure to check out Paul's blog, Three Letter Word For Art. Love that title. Outrageously Off-Topic Indulgence Last week, BBC period dramas. This week, hard-boiled American cop shows. I'm really enjoying The Chicago Code, the new show by Shawn Ryan. I previously poured out my love of his show Terriers here, and I hope that The Chicago Code gets a chance to build on what it's doing during its first season. Give it a shot! I didn't take notes during class when I was in school, and I don't take notes during work meetings now. It gets so tedious to tsk-tsk at reporters who write bad articles about paleontology that I've gotten away from doing it here, for the most part. In the early days of writing this blog, I imagined that such posts would be staples. I didn't realize how depressing a topic it could become. Just wander through some of the posts tagged science communication at Archosaur Musings to see Dave Hone's personal trials with sloppy, lazy, misguided journalism. But it's nothing new. I ran across this popular press account of a fossil discovery in an 1825 issue of The Gentleman's Magazine, which shows that the media's ability to absolutely mangle paleo stories is part of a long, sad tradition. Various fossil remains, among which are some bones of a gigantic crocodile, and certain traces of the megalosaurus and pleiosaurus, have been found in the sand stone of Tilgate Forest, Sussex, and also those of an enormous animal thought to be the iguadom. The teeth are evidently those of an herbivorous animal of extraordinary size, not less, according to the proportions of the remains, than 60 feet in length; and it is considered to have been an amphibious species of animal. That should be followed by one huge [sic]. What precisely did the writer and editors expect people to gather from this account? Typos galore, confusingly worded, and vague. Shouldn't the novelty of paleontology as a field of study have warranted more dedication to reporting this? It almost reads like they simply typed up the hastily-written letter of a local farmer and didn't bother checking up on it. For shame, The Gentleman's Magazine. The gentlemen for whom your periodical is intended to provide entertainment and information have been poorly served. I recently opened my email to find a lovely gift, spread across three messages: a set of German dinosaur trading cards, simply and appropriately titled Dinosaurier. 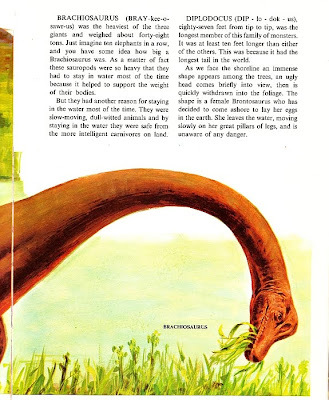 They were donated generously by reader Olliver Krone, and I hope I make him proud with today's Vintage Dinosaur Art post. I apologize for being two days tardy, but this weekend and Monday were more hectic than usual for me, and I couldn't do these justice. They were released by the publishing company Altenburger Speilkarten, holders of a truly unintentionally hilarious abbreviation and logo (for the English-speaking world at least, and this similar set is even funnier). Olliver received them in the mid-nineties, but was not sure about the original publication date. 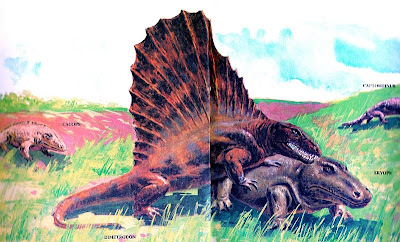 One reason I find the work of this unidentified illustrator so delightful is that it is a perfect illustration of how dinosaurs have been unfortunately stained with the word "reptile" since the very beginning. People are slowly, grudgingly accepting the evidence that the dinosaurs were a more bizarre, diversely adapted group of creatures than many of us were led to believe as children. But they will always be branded with the -saur suffix, and in some sense will always be as much lizard as they are terrible. But these cards take it to the extreme. Witness this hilariously wrong, crocodylian Velociraptor. From the claws of its scaly, humanoid hands to the tip of its nonexistent sickle-claw, this is nearly unrecognizable as the world's favorite dromaeosaur. At least Velociraptor gets to eat its usual diet. Not so for Compsognathus, oddly marked as a veggie-saurus. Poorly understood Procompsognathus is depicted similarly, though the icon in the information box is that of a carnivore. Daspletosaurus, on the other hand, gets to eat its meat, in gruesome fashion. In countenance and scaly integument, it's hard not to see a bit of Knight's Leaping Laelaps in the mystery illustrator's theropods, also evident in Ceratosaurus and Allosaurus. I've saved the best for last: what may be the most ridiculous Spinosaurus I've ever seen. A Dimetrodon and a monitor lizard have somehow conceived a chimeric offspring. I can only imagine that this was inspired by occasional paleontological conjectures that Spinosaurus was a quadruped, but to veer so drastically from the theropod bauplan is folly of the highest order. Please don't be nonplussed by my high dudgeon. This is serious business, folks. Update, 9:15 PM: A commenter has brought up the possibility that this is a simple case of mistaken identity, confusing Spinosaurus with Dimetrodon. Sadly, this is not the case! Because of the size of the collection, I've chosen to focus only on theropods today. I'll revisit the collection's take on other branches of the dinosaur family tree in the future. Feel free to take a peak at the rest, housed cozily at my Flickr photostream. If you happen to have an idea of who might be the illustrator, please let me know in the comments below. Again, I thank Olliver for kindly sending me these via email. If you've got old dinosaur artwork you'd like to share, I'll gladly feature it here - just share it at the Flickr Vintage Dinosaur Art pool or email them to me at the address in the sidebar!